The 15th of each month at 12 o’clock sharp Paris time, we post a photo on a specific theme defined by one of the members of La Photo du Mois (Photo for the month), a group of worldwide amateur bloggers and photographers. It’s such a great opportunity to share our photos and best travel memories with you. The theme of this month is the tourists, chosen by BiGBuGS. For a few years now, Chinese tourists have been flocking to Southeast Asia, like on the photo above in Northern Thailand. They arrive in large groups, overexcited, into touristic sites, which obviously contrast with backpackers. Unlike backpackers, Chinese tourists wear colourful or at least chic outfits, which must let some scruffy Western travellers a bit disconcerted. They roar with laughter or speak loudly, when Westerners dream – in vain – of blending in with the crowd. They look like children, enjoying the very first taste of independence; they act spontaneously and with no reserve, especially when it comes to play with their favourite toy, the selfie stick. 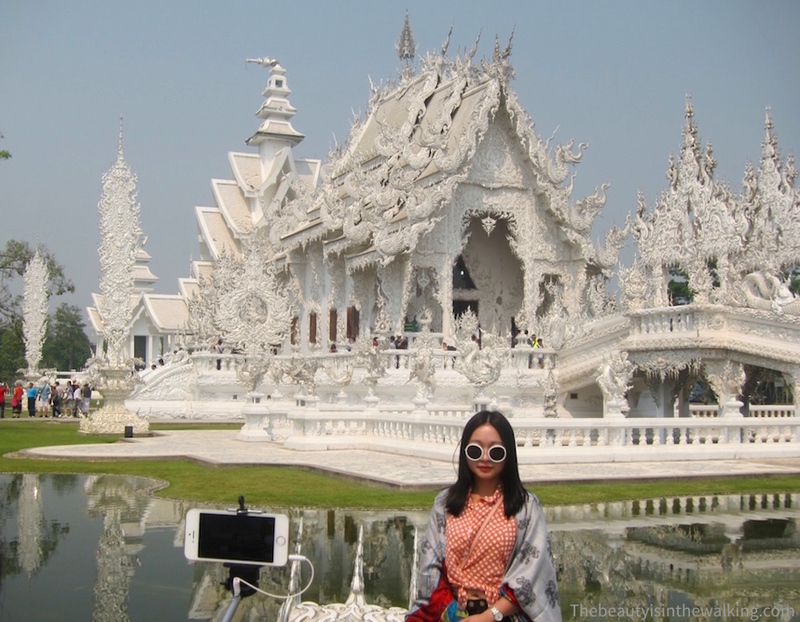 At first, we all say “Wow!”, and then “What the hell is this?” Well, this is the White Temple – Wat Rong Khun. It’s located in Chiang Rai, in the very North of Thailand. It was built by Thai artist Chalermchai Kositpipat in honour of Rama IX (the present King of Thailand), as well as his hometown. Unlike any other temples, this one looks very extravagant, as shown first of all by its whiteness, which symbolizes the purity of Buddhism. The bridge that leads to it crosses over a pond in which we can see the hands of creatures coming from hell. Inside the White Temple, we can recognize Michael Jackson or Sponge Bob painted on the walls… Well, it’s worth looking at it in detail as it has come out of an overflowing imagination. Started in 1996, the White Temple is still in progress, even if it’s already huge. It should comprise nine buildings in total that will stand as an illustration of the artist’s vision of the Buddhist paradise on Earth. Surprising temple, isn’t it? Have you ever been there? Oui, c’est vraiment remarquable comme endroit !